Cover up a tattoo, bruise or scar instantly with LIP INK® Semi-Permanent ® Instant Cover Up that is safe to wear 24/7 and is guaranteed smear-proof. LIP INK® Off Solution cleanses the skin allowing the natural mineral powders to veil any tattoo, bruises, or scars by camouflaging it to match your skin tone while the LIP INK® Liquid Lipstick in Clear acts as a perfect sealer by encapsulating the mineral powders, making it smear-proof, long lasting, and waterproof, ensuring that it doesn't smudge. The product can and should be layered at least three times until the blemish and the surface area is fully blended. Go swimming or jogging, rub or scratch, the blemishes will not resurface. Purify the area of the skin that you wish to cover with LIP-INK® OFF SOLUTION. Then splash with water and pat dry. Apply one thin layer of LIP-INK® COLOR CLEAR in one direction over the entire area that you wish to cover. *Note: Not compatible with pressed powders. Note: The LIP-INK® COLOR CLEAR should still be wet. Apply your loose mineral powder with your favorite make up brush in a color that matches the area to be covered. Repeat steps 2 & 3 until the area is completely covered. The final step should be the application of your loose mineral powder. IMPORTANT REMINDER BEFORE USE: Upon first application of our classic LIP INK® Clear, open the vial carefully, as LIP INK® formulas are LIQUID. While opening LIP INK® Natural Mineral Powders are purposely filled low, they have no inside cover under the cap. This is by design so that you can shake them inside the jar before opening. Both can spill, or splatter when in contact with clothing, carpet, etc. Keep out of heat. 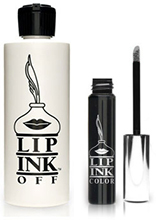 SAFE PRODUCT FOR USE: Please read through all instructions before opening any LIP INK® products. If you experience any adverse reactions from the use of this product, immediately discontinue use. NOTE:The LIP INK® Products may tingle, this reaction is normal. The sensation is due to the natural herbs and botanicals. The LIP INK® wax free, guaranteed smearproof & long-lasting, multi-patented color product line is not compatible with any other cosmetic products. LIP INK® Color Cosmetics are based on scientific research and are protected by U.S. and International patents. Competitive products cannot legally duplicate LIP-INK Color Cosmetics and their precise chemistry.